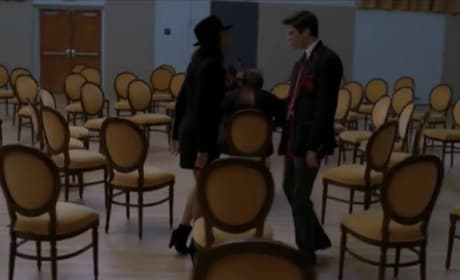 Naya Rivera and Grant Gustin go at it here for a performance of "Smooth Criminal." It's impressive stuff, courtesy of the Glee episode "Michael." 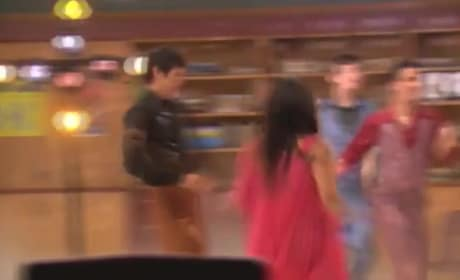 Sam and Mercedes will duet on a classic number from Grease on the episode "Yes/No." Take a listen to their take on "Summer Nights" now. What does the Glee cast want for Christmas? The answer is simple, as this video proves: YOU. A returning Chord Overstreet leads New Directions here on a rendition of a Toby Keith classic. Watch and listen to the group sing "Red Solo Cup" now. The Trouble Tones do their thing during Sections in this clip from Glee, causing us to wonder: Can New Directions keep up?!? We're excited to present the 300th musical number ever sang on Glee. It's an Adele mash up, led by Santana and Mercedes. Take it away, Mike Chang! 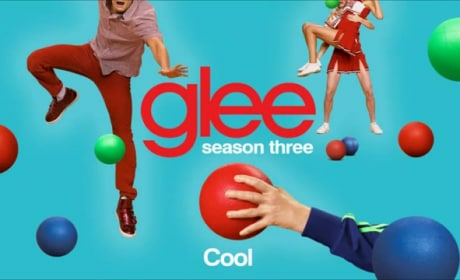 This Glee character usually dances, but he takes the lead on "Cool," a cover from "Asian F."
Rachel: While we applaud your proper use of the terminology, we told Mr. Schue: we do not support disco. Permalink: We do not support disco.